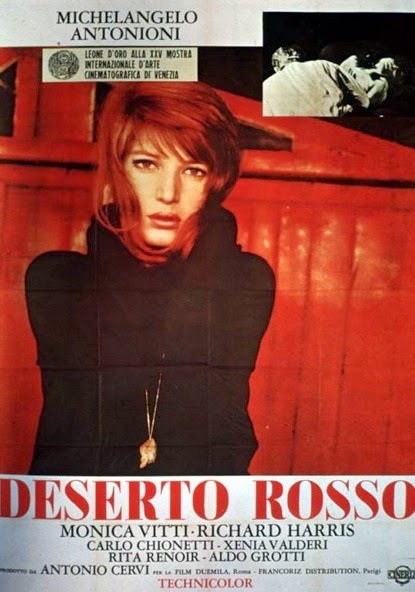 Red Desert makes for a strong case of requalifying Antonioni’s ‘Alienation Trilogy’ as a Tetralogy; it masterfully propounded the themes of alienation, ennui, shallow relationships and existential crisis in a modern world, as did L’Avventura, La Notte and L’Eclisse, and had his muse Monica Vitti in the lead – only that, unlike the three films preceding it, it was not in B/W. The Italian maestro’s first foray into colour filmmaking, it provided a harrowing portrait of “progress” – a bleak and haunting look at how relentless industrialization and uncontrolled technological growth might be accompanied with spiritual desolation and widening of gaps between humans instead of bridging them. The beautiful and enigmatic Giuliana (Vitti), wife of Ugo (Carlo Chionetti), the manager of a generation plant, and mother of a kid son, is suffering from depression and malaise, ignited by a car accident in the past, and subliminally exacerbated by her ravaged surroundings. The devastation caused by the plant’s unapologetically polluting nature, and the incessant strikes and conflicts between the plant’s management and workers, formed a key juxtaposition to her emotional estrangement, increasingly erratic nature, formation of irreparable marital fissures, and her growing bond with dandy and emotionally impregnable British engineer Corrado (Richard Harris), who’s come to recruit low-cost labour for a project in South America. The dour, grimy and barren landscape, and the monster-like plant’s belching smoke and poisonous detritus, was brilliantly captured by the breathtaking colour photography, with its grainy images and shallow depth of field. Preminger’s superb romantic-noir Angel Face provided a dark and discomfiting peek into Freudian jealousy, obsession and sexual insecurity. 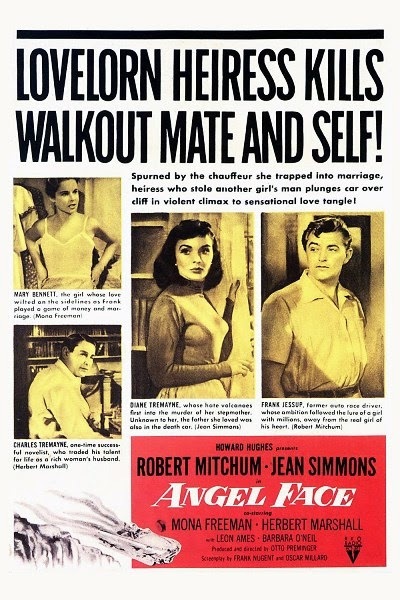 And Jean Simmon’s Diane Tremayne ought to rank amongst the most self-serving, duplicitous, alluring and brilliantly etched femme fatales along the likes of such iconic characters as Ava Gardner’s Kitty Collins in The Killers, Jane Greer’s Kathie Moffat in Out of the Past, Barbara Stanwyck’s Phyllis Dietrichson in Double Indemnity and Mary Astor’s Brigid O’Shaughnessy in Maltese Falcon – so much so that she even managed to outshine a top-notch Robert Mitchum. Frank Jessup (Mitchum) is a two-bit ambulance driver in a relationship with the loving Mary (Mona Freeman); an untimely halt at the house of the Tremaynes for a seemingly regular case of gas poisoning, however, kick-starts his journey downhill. He makes the acquaintance of Diane, a sad, beautiful and lonely 19-year old girl whose alluring looks mask a dangerous and sociopathic core. She plans to get rid of her wealthy stepmother (Barbara O’Neil), in order to be the sole companion of her novelist father (Herbert Marshall), and teasingly engages the dour-faced and world-weary Frank to that effect – and boy does he make him dance to her tunes even when he realizes he’s being taken for a chump! Preminger marvelously alternated quieter moments with harsh and brutal sequences, and laced the proceedings with cynical edge and fatalism. And in Diane we have a thoroughly inscrutable and unpredictable damsel who just doesn’t have a moral compass or conscience. The fine B/W photography and terrific organ-based score formed the perfect foil to the film’s moodiness and bleak atmosphere. Love is Colder than Death can perhaps be described as American Noir and Gangster genres meet French Nouvelle Vague sensibilities meet the mercurial Rainer Werner Fassbinder’s idiosyncratic style. RWF’s assured debut feature, it portrayed crime, violence, camaraderie, love and ménage à trois through a strange prism of pastiche, personal statement and adventurous formalism. 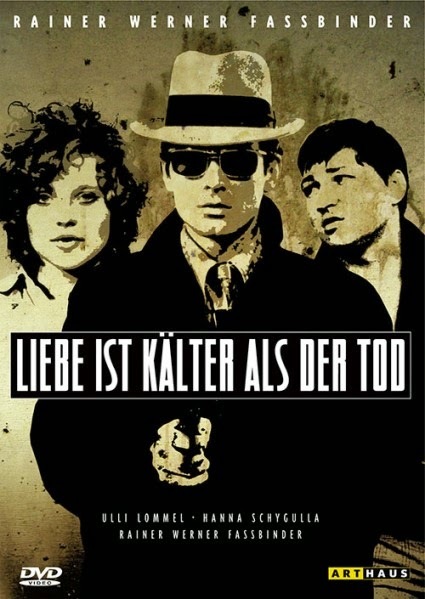 The film begins with Franz (Fassbinder), a brutish and daredevil small-time pimp and hoodlum, being tortured by the Syndicate to join their organization. Upon realizing the futility of their exercise he’s allowed to leave, but Bruno (Ulli Lommel), a young sharp-shooting gangster in the making, is engaged to follow him. What eventually follows is a wicked and unpredictable tryst between the two outsiders and Franz’s alluring and seductive prostitute girlfriend Joanna (Hanna Schygulla). They chat, make bizarre plans, rob stores, kill people and make love in this restless and hyper-stylized film stripped of conventional plot developments. Influences of early-Godard – Bande a Part in particular, and Melville’s Le Samourai were evident in this wacky concoction served by RWF, with the deliberately theatrical set-pieces and an understated streak of sly fun at the audience’s cost, making this a rather interesting piece of work by the prolific New German Cinema icon. The fourth-wall was often breached, the narrative was often interspersed with scenes that seemed out of place were, moments of alienation were alternated with black humour, and genre symbols were both evoked and discarded in this alternately off-putting and intriguing little film. The sexual chemistry between the American noir prototype Franz, Alain Delon look-a-like Bruno, and the sassy, promiscuous Joanna, was particularly noteworthy. 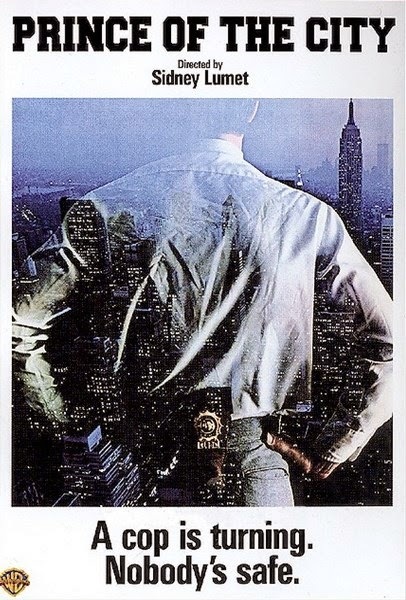 Q & A, which along with Serpico and Prince of the City formed a trilogy on New York police corruption, and based on real events, ranks among Lumet’s most underrated works. Though not bereft of flaws, this provided a tense and gripping account of how racial hatred and bigotry have permeated within the force, and the easy acceptance of violence and realpolitik. 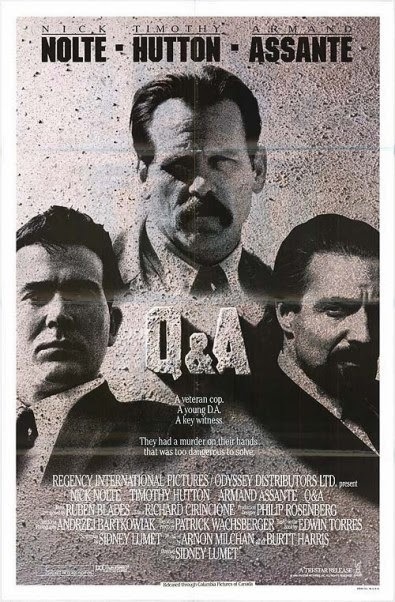 The film begins with veteran cop Lt. Mike Brennan (Nick Nolte) eliminating a small-time crook in cold blood and then makes it look like self-defense. ADA Al Reilly (Timothy Hutton), a rookie lawyer and former cop, is assigned this seemingly open-and-shut case as Brennan is considered a hero within the department. Al, however, is not the kind of person to take things on face value, and the more he digs into the case and its murky details, the greater the stink it starts generating. Consequently, he ends up having to deal with multiple foes in order to get to the end – the psychotic and dangerous Brennan, a suave Puerto Rican drug dealer (Armand Assante), and the increasingly hostile DA who wanted a quick closure, while he gets assistance from a cynical and honest senior DA official (Lee Richardson). Nolte gave a volcanic turn as the shrewd, nasty, unapologetically racist and thoroughly unpredictable Brennan; the sheer vitriol that his character spews on non-whites, transvestites and prostitutes, and his explosive nature, made for disturbing but compelling viewing. Assante and Richardson were also good, while Hutton, as the naïve but upright lawyer, was effective. The time spent on Al’s liaison with his former flame, however, could have been cut short, and the script could have been made tighter – but these were minor blemishes that can be ignored.